Increased competition from 5G fixed wireless, transformation to gigabit IP services, complex OTT service bundling, and rising operational support costs are key challenges for cable ISPs offering residential broadband services. Extending footprint with fiber to capitalize on new service opportunities means decisions on whether to leverage DOCSIS provisioning for fiber or introduce a new fiber stack. These challenges can be solved with a new approach to service management for in-home broadband management – Incognito Service Orchestration. 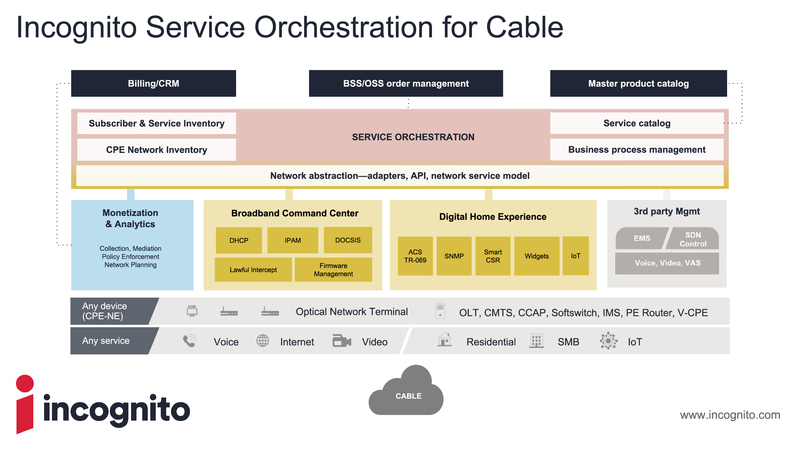 Incognito offers a complete service orchestration solution for cable Internet service providers. We provide a modular, productized software suite to support DOCSIS provisioning and device lifecycle management, TR-069 remote device management, firmware management, lawful intercept, and automated service activation, as well as monetization and analytics. With a 20+ year pedigree in cable provisioning, we are the partner of choice for in-home broadband management for 200+ cable providers globally. Part of a European operator group, this service provider acquired a cable operator and faced a time to market crunch to launch new triple-play service bundles. Maintaining excellent customer experience was vital to business expansion and their brand. Operational needs included rapid customer device provisioning, automate ongoing management of all devices, and accelerate customer care. Using Incognito DOCSIS provisioning coupled with Digital Home Experience Solution including Incognito's TR-069 Auto Configuration Server, this service provider was able to launch new triple-play services in months, automate customer care processes with a standard tool to identify and resolve customer issues and prioritize customers based on service tier. Additionally remotely managing all customer devices, including legacy non TR-069 devices, and gaining visibility and diagnostics across multiple vendor devices. A North American service provider required a firmware management solution to address issues associated with outdated firmware. Incognito provided an automated firmware management solution with role-based controls for improved security, highly flexible firmware update triggers, and a holistic network-wide view of device firmware status. With Incognito, this service provider reduced operational costs and improved controls to ensure updated firmware across the network. This American MSO implemented Incognito's Monetization and Analytics to analyze IPDR billing data, and determining appropriate data caps for their subscribers, paving the way for a national metering launch. Additionally, our cable MSO burdened with manual DOCSIS legacy network process inefficiencies. The operational system support also inhibited IPv6 service introduction, exposing MSO to competitive threats. Incognito's cable solution simplified the MSO's network-wide rollout using a single integrated platform for DOCSIS and GPON fiber networks, usage-based metering, and automated provisioning for all cable/fiber residential and business IPv4 and IPv6 services. Incognito's standard compliant DP0G deployment supporting ~25 million IPs/devices. With over 20 years’ experience, Incognito has helped global providers accelerate and innovate broadband services, with a unique focus on cable, fiber, and mobile broadband technologies.